Helping Horse, a therapeutic riding program, serves physically, mentally and/or emotionally disabled youth throughout Wake County. 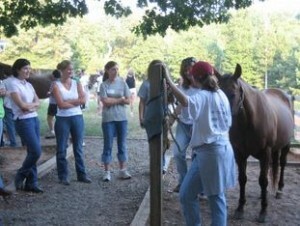 They offer group riding lessons, focusing on providing a therapeutic experience for each rider. Helping Horse combines riding skills with games and activities to enhance riders’ strength and balance, all while having fun! Most lessons take place on horseback, though occasionally they hold ground lessons for riders to learn horse care skills like grooming and tacking. This certified nonprofit is a fully-volunteer organization and is dependent on the charitable support of locally interested individuals and businesses, including the Junior League of Raleigh. JLR volunteers serve as horse leaders and side-walkers at weekly riding lessons during the traditional school year. League volunteers also plan special events for children involved in Helping Horse. The program currently enrolls 40 disabled individuals and is exploring the option of adding a disabled veterans program.